During your Ireland Honeymoon you will be staying in selected ancient Castles, stately Georgian Manors and comfortable Village Inns.The hotels are of a country house style, typically offering luxurious accommodation, character, charm and friendliness. Excellent service and a lovely setting combine to ensure maximum comfort for you on your special vacation. During this 10 day honeymoon journey you will be staying in selected ancient Castles, stately Georgian Manors and comfortable Village Inns.The hotels are of a country house style, typically offering luxurious accommodation, character, charm and friendliness. Excellent service and a lovely setting combine to ensure maximum comfort for you on your special vacation. Day 1: Pick up your car at the car rental desk and drive towards the eclectic town of Galway, nestled on the rugged west coast. Your first night's dinner in Ireland will be in the historic Pullman train carriage. The Pullman has experienced a very varied life. Built in 1927, its routes included the Monaco/Istanbul/St. Petersburg runs, and also the Brighton run. The Dining Carriage, named "Leona", was formerly a 1st Class Parlour Car, and the richness of wood, marqueterie and brass-work within it reflect this former "raison d'étre" and offer an extraordinary dining experience. In 1974, it played a starring role in the Agatha Christie film "Murder on the Orient Express". That never to be forgotten movie, directed by Sidney Lumet, featured a host of Greats, including Albert Finney, Ingrid Bergman, Sean Connery, Vanessa Redgrave, Lauren Bacall and others. Day 2: Once you visit the City of the Tribes, it will be hard to leave... experience the vibrancy of this cosmopolitan city for the day. 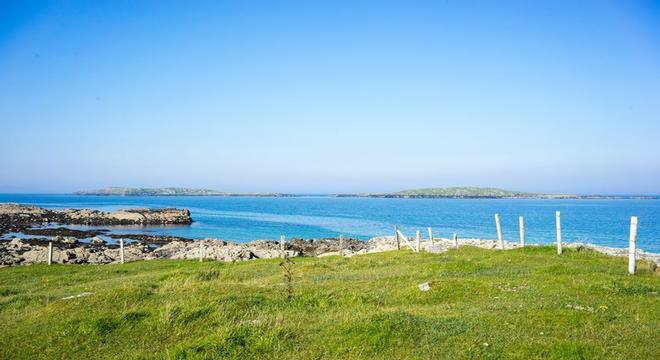 Take a drive out to Connemara or visit the Aran Islands, it will certainly be worth your while to experience this rugged landscape. In the evening, take a trip to the theater or experience the ambiance of one of Galway's many pubs. Day 3: Having had a wonderful time in Galway, you can take the coast road south into Co. Clare, Ireland's "singing county". Driving through the fishing villages of Kinvarra and Ballyvaughan, you will soon be marvelled by the limestone formations of the The Burren, an area with a sense of spiritual peace, prehistoric monuments, deserted famine villages and extraordinary flora and fauna. Close by are the world famous Cliffs of Moher, a line of sheer cliffs some 8km in length and over 200m high. Sitting next to O'Brien's Tower, one immediately gets the feeling for the forces of nature and the wildness of the country. 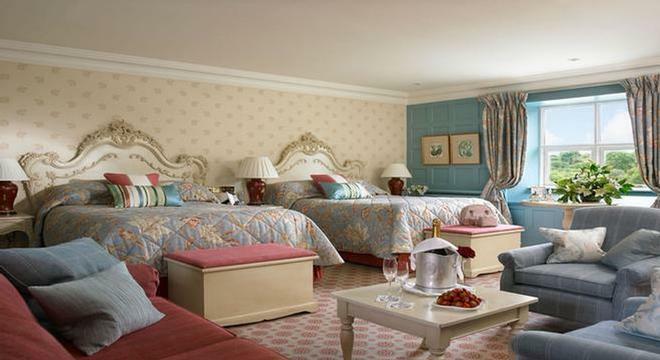 Finish your day in the splendor of Dromoland Castle where a night of luxury awaits you. Be a King and Queen for a night. Day 4&5: You will leave Bunratty, travelling into "Kingdom of Kerry", an area of rugged peninsulas, clean beaches, towering mountains and some of Ireland's most famous landmarks. Killarney needs no introduction, due to its reputation built up by years of tourism, however a visit to Killarney is incomplete without an exploration of Killarney's National Park. The following morning, take the road to Dingle and experience the beauty and wonder of Slea Head, the Conor Pass and Inch Beach. Or follow Ireland's most famous route, the Ring of Kerry into the village of Portmagee to take the boat out to the rocky outcrop of Skellig Michael, arguably one of the most remote and mystic religious sites in the world. The ferry crossing out to the islands is highly weather-depending, but are an unforgettable experience on a fine day. Day 6&7: Driving south to Cork, you will slowly witness a transformation in the scenery. The mountains and valleys of Kerry give way to the greener pastures and broader valleys of West Cork. The valley of Glengarriff is famous for its warm and subtropical climate. Ancient forests are a welcoming break after the barren moorlands of Kerry, and Garnish Island harbours one of Ireland's most famous gardens. 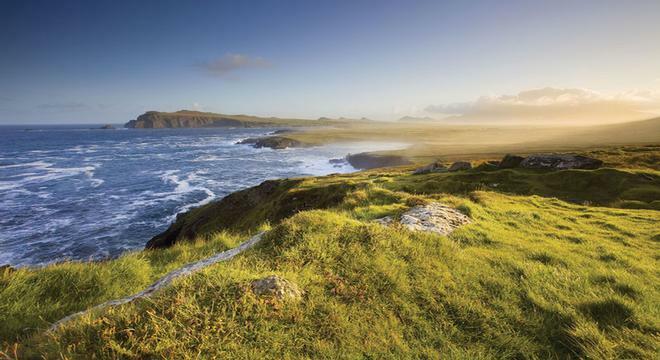 West Cork, one of the most beautiful parts of Ireland is also Ireland's southernmost region. From Mizen Head Lighthouse, the next stop is New York City. The lighthouse itself has been transformed into a small visitor centre and can be reached over an arched bridge and 99 steps. The island of Cape Clear off the West Cork coastline is Co. Cork's last refuge of the Irish language. Boats leave from Schull and the fishing village of Baltimore. Hike the heather and gorse-clad hills, the locals will assist you to find the megalithic marriage stone. Day 8: Leaving Baltimore, you will embark on your journey towards Cork, Ireland's second largest city. Experience the delights of Clonakilty, Tidy Towns Winner and winner of the Entente Florale 2000, and take in the towns and villages of Skibbereen, Glandore and Union Hall on the way. A visit to Cork is incomplete without a trip to the quaint town of Kinsale. Cork is built in a valley and is surrounded by the famous River Lee. You can spend the day in the city, taking in attractions or the many shops, restaurants and bars which the city has to offer. Day 9: This morning, you will return to the Shannon region. Don't forget to kiss the Blarney Stone, which has the traditional power of conferring eloquence to all who kiss it. In the 19th century, the harbour town of Cobh used to be a major embarkation point for people emigrating to the 'New World' - America and Canada. Its unique history and legacy are dramatically recalled at The Queenstown Story - a stunning multi media exhibition at Cobh's restored Victorian Railway Station. Themes include The Titanic, emigration and the Great Famine. Finish the day in the village of Adare, often described as the prettiest village in Ireland. A regular winner in the Tidy towns competition, Adare scooped the national title in 1976 and has been a contender ever since. Adare is a place steeped in history - a Norman Castle beside the river Maigue and the best collection of ruined medieval friaries in Ireland. These include a 13th century Trinitarian monastery, a 15th century Franciscan Monastery and a 14th century Augustinian Monastery. Today you will take your flight back from Shannon, with the memory of a wonderful honeymoon. You will probably have enjoyed your 10 days touring Ireland so much that you are keen to spend more time sampling Ireland's many delights... why not prolong your stay and combine your 10 days driving around Ireland with a week exploring the magical coasts on board a cruiser or pampering yourselves at one of the finest hotels in Ireland - The Park Hotel in Kenmare.